Are you fed up with flat or ghost like subjects? If you are bored of using onboard flash that results in unpleasant, blown out highlights, red eye, and harsh shadows then go for external flash. You will find the shortage of original control and harsh light in small built-in flashes as they do not deliver significant outcomes. Often they cause red eye that spoils the lively mood as everybody prefers appealing pics. No need to worry at all. Here I will make you relaxed by sharing the benefits of external flash for professional photography that will provide you remarkable results. So let’s proceed with the discussion. Save battery life – External flash will not consume camera’s battery as it holds its own batteries. Often you can fire the flash without waiting between the shots for the prolonged time as it features faster “recycling” time. Extra Power – You can illumine wider shots and subjects at the greater distance as it covers 15 times more power than onboard flash. Diffusers for clear looking – For natural and clean looking you can purchase diffusers that catch the flash. To change the color of the lighting, you can move for color diffusers. Reflectors – The power of bounded light and viewpoints can be altered with the help of reflectors. Flexible angles – The angles are inclusive in variety that moves the light due to the rotation of external flashes as such you can enjoy adjustable angles. Lessening of red eye – Chances of red eye are comparatively very less as the light does not come from close to the center of the camera. Cover greater distance – Being powerful it can cover the larger range. The farther subjects will reflect enhanced illumination. Control and creative lighting – You have complete control of the lighting as you can adjust the brightness as per your choice. You can try new positions, approaches, vividness, and angles due to infinite lighting options which add creativity to your work. Natural with additional options – You can experience natural light as if coming from above or from the side. It won’t reach straight in front of you. Per your desires and preferences, you can position the flash as it is not connected to the camera. So I must say that you can freely enjoy the alternatives of settings, trivets, and remotes. 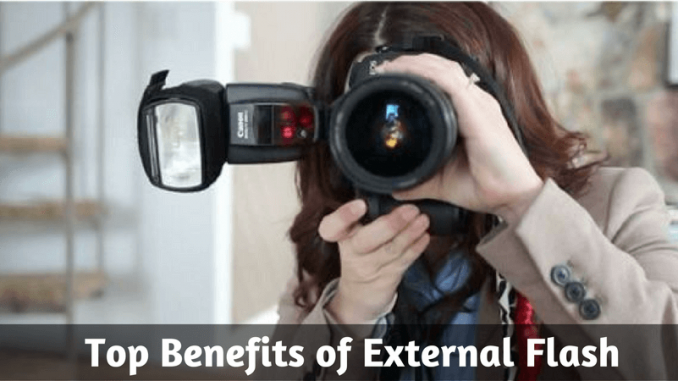 From the views as mentioned above, you can easily make out what are the benefits of external flashes. In spite of their weight and size, they proved to be outstanding over built-in flashes. Maybe you face little inconvenience in using the external flash at start, but on seeing the results, you will find it remarkable and worthy than a built-in flash. The great feature you will enjoy is the directionality due to which you can bounce larger surface. You can remove it from the camera and fix it in the different location. If your surroundings get too dark and you are willing to have additional light, then move ahead for best external canon flash which will provide you impressive results in daytime. In any images, it will offer you artistic touch. If photography is your passion or profession, then you can confidently go for the external flash that will remove harsh shadows and dull colors. It will make your photography lively and alluring.